Sporting clubs such as ours play a significant role in the community and have a responsibility to our members and their families. 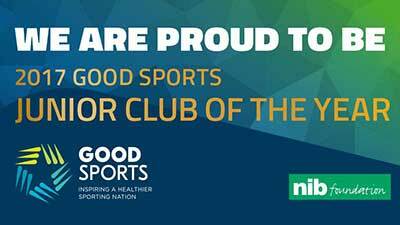 We have chosen to join over 7000 clubs across Australia taking part in the Good Sports program. Through Good Sports we are committed to managing alcohol responsibly and ensuring smoke free areas, which we believe will help us to provide a healthy, safe and family friendly environment. We are also part of the Good Sports Healthy Minds program. Sport plays a huge role in improving mental health in Australia, and as part of the Good Sports Healthy Minds program, we are tackling mental health issues. Mental illness impacts everyone and we are dedicated in removing the stigma surrounding mental health. As a Good Sports club, we are committed to educating our community about mental health and we will promote improving mental health with our coaches, club members, committee, players, parents and families. We believe it’s important to offer healthy choices and educating our children and club about the benefits of better food and drink while addressing the harms of eating fatty and sugary junk foods. Many canteens prominently feature unhealthy food and drink options such as fried chips, pies, chocolate and soft drink. There are numerous healthy options and as a Good Sports accredited club we are committed to greater nutrition. Together, we are helping inspire a healthier sporting nation. Speak to our club committee about what being a Good Sports club is all about or visit www.goodsports.com.au. This award recognises a club who has inspired positive change by creating a safer place for juniors to play sport by focusing on spectator behaviour, nutrition and alcohol.